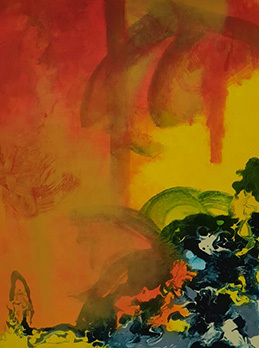 KNOXVILLE – The Arts & Culture Alliance is pleased to present five new exhibitions at the Emporium Center in downtown Knoxville from August 3-31, 2018. A reception will take place on Friday, August 3, from 5:00-9:00 PM as part of First Friday activities downtown to which the public is invited to meet the artists and view the artwork. Most of the works are for sale and may be purchased through the close of the exhibition. 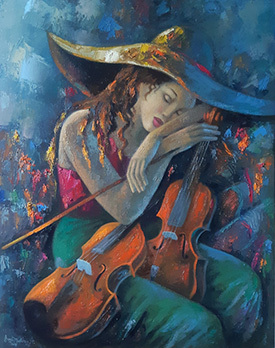 Sergio Martinez Avila is from Tegucigalpa, Honduras and has more than 26 years’ experience in artistic production. His work is a process of gradually evolving technique and themes, which often explore the fantastical qualities of the world. He sustains an imaginary fiction using the female figure and other competing forms, creating sensory properties and relations of bodies by building an architectural and urban scene. Martinez achieves this scenery through the delicate handling of color, keeping the proportions between the realistic and the fantastical clean and simple. 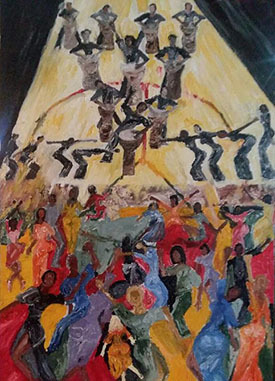 Martinez Avila attended the Instituto Nocturno Francisco Morazan in El Zurzular, Honduras and has exhibited internationally in Canada, Finland, Honduras, Mexico, Peru, and the United States. Iván Soto Hernández is from San Esteban, Olancho, Honduras and currently lives in Knoxville. He studied at the Escuela Nacional de Bellas Artes (ENBA, or National School of Fine Arts), the main center of education and training of artists in the republic of Honduras, where he received a diploma in Plastic Arts (a newer artistic genre). Plastic arts are art forms which involve physical manipulation of a plastic medium by molding or modeling such as sculpture or ceramics. He has participated in international group exhibitions in Canada, Cuba, Honduras, Mexico, Peru, El Salvador, and the United States. His work is on permanent display in galleries in St. Petersburg, Florida; Tegucigalpa, Honduras; and via representation in Canada. Eric Holstine, EHArtwork was born and raised in Charleston, WV. He is an IT professional, who also incorporates his computer education and training into his artwork. He works with a variety of media, including stained glass, metal, wood, acrylics, and polymer clay. He frequently incorporates electrical features into his art. Holstine's work has been shown at Steam at Harper's Ferry in WV; The Steampunk World's Fair in Piscataway, NJ; the Emporium Center and Marble City Comicon in Knoxville; as well as events in Gaithersburg, MD, and Charleston/Huntington, WV. For more information, please visit www.EHArtwork.com. Jason Edwards works with acrylic paints, markers, inks, spray paint and charcoal on paper and canvas. He also works with woodblock printing, digital painting and video. His painting and woodblock styles are whimsical, while his videos are very conceptual. 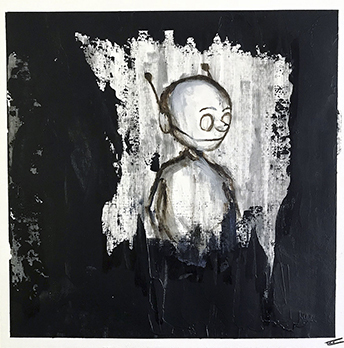 Edward’s paintings often reflect other people’s emotions, and themes in his videos mostly deal with his own emotions. In his works, he seeks to remind viewers it is okay to be a human living in a world that is unbalanced and extreme. For more information, please visit www.Jordebot.net. Experimentation is Jason Lambert’s primary goal. 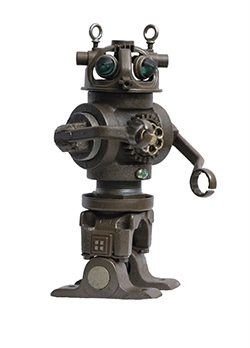 While originally working in pen and ink he has also transitioned into use of copper, steel, sharpies and nail polish to create unique 2- and 3-D works. His degree in geology and minor in anthropology from the University of Kentucky have helped inform a love of old science he applies to new art. “I never truly consider my work finished, only stalled or given away,” says Lambert. “The process of creation and fusion is what really attracts my imagination. My current body of work includes captured moments or thoughts I am attempting to flesh out.” For more information, please visit www.facebook.com/ExplorationsInMetal. Eriel Scott, Eriel Shea Photography was born and raised in Charleston, WV. She is an independent photographer, as well as a Graphic and Multimedia Designer, who strives to show the emotion behind the moment. Her portfolio includes weddings, senior sessions, animals, boudoir, and nature themes. She is always excited to capture special moments that will resonate for years to come. Her photography has been featured in Senior Model Magazine, Two Lane Living Magazine, and the Charleston Gazette Mail, with other work on display in the Charleston, WV area. For more information, please visit www.erielsheaphotography.com. As a native Montanan, Rex Redd had the blessing of growing up immersed in natural beauty. Redd attended the University of Montana at Missoula where he graduated with a degree in Anthropology, and his love for historical cultures and traditions from around the world is an influence throughout his body of work. 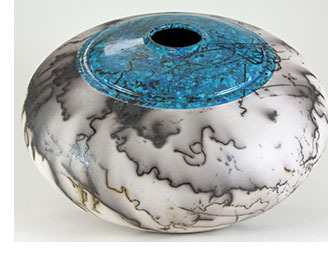 After moving to East Tennessee, Redd met Bill Capshaw and worked with the pottery program at the Oak Ridge Art Center. He works in several other mediums including painting, printmaking, photography and wood, often incorporating more than one into a project. He has work in several private and corporate collections throughout the United States, as well as Europe, Japan, and Australia. Confluence - An act or process of merging. As a mixed media artist, this concept is nothing new to Redd’s work. Bringing together a variety of materials to make a cohesive piece of work is at once challenging and rewarding. But what happens when over the years you have worked in several unrelated disciplines? Recently, one of his students asked, “How do you decide on any given day what you’re going to work on?” This show is in response to that question and includes traditional and cross-disciplinary raku work. “I never set aside one art form to pursue another out of boredom,” says Redd. “Something I was doing sparked a desire to explore more creative avenues. This amalgam of acquired skills and interests led me to a personal crossroads; either pick one and concentrate on that discipline, or bring them all together and see what comes of it. Therein lies the confluence.” For more information, please visit www.rexredd.com. 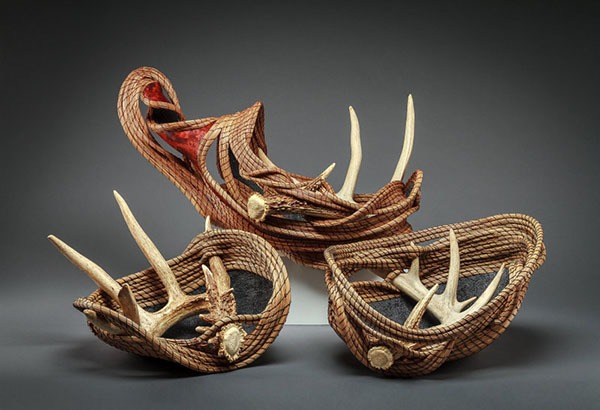 Marty McConnaughey will display various sculptures that use gourds as a base with pine needle and sweet grass coiling, antlers, and other natural materials. She will also display giclees of other works. Artist statement: There is an endless amount of inspiration throughout nature; it only takes a moment to see its real beauty. Using gourds as a foundation helps create a unique sculpture by incorporating objects that nature itself provides. I love the art of coiling pine needles and sweet grass in my work; it gives a subtle movement drawing the onlooker to a journey that is both captivating and soothing. I continue to pursue and discover new elements on a regular basis to incorporate into my endeavors. The simple use of driftwood, acorn tops and strips of copper that I call ‘nature’s treasures’ are found throughout my creations. Each piece I design is hand crafted to be distinctive and bring an element of drama to enhance a wide range of decors. My appreciation and love of our Creator with all the patterns, texture and colors He give us draws me to make unique pieces of art that will bring joy and inspiration to others. For more information, please visit www.distinctivegourds.com. Donaldson aims to tell a story with his art, and the recent work he will display features many subjects such as climate change, human trafficking, Harlem Renaissance culture, political and social issues, racism & classism, and more. The exhibitions are on display at the Emporium Center, 100 S. Gay Street, in downtown Knoxville. Exhibition hours are Monday-Friday, 9:00 AM - 5:00 PM. For more information, please contact the Arts & Culture Alliance at (865) 523-7543, or visit www.knoxalliance.com.